A couple of months ago I designed and styled a Royal Wedding inspired shoot for Seattle Met Bride & Groom. You might remember the sneak peek I posted here. My copy just arrived in the mail and it is so fun to see the final product. I designed the flowers with a modern princess in mind. Two different bouquets – one more formal in faded pastels and one more loose, organic and playful made up of Amnesia and Quicksand roses, hellebore, anemones, pink jasmine and ranunculus in royal shades of burgundy, purple and faded pink. I wrapped the bridal bouquet with antique seed pearl beading and incorporated vintage silk velvet leaves in the boutonniere. A few weeks ago, I was asked to design the flowers and coordinate the prop styling for the main fashion story in the current issue of Portland Bride and Groom magazine. 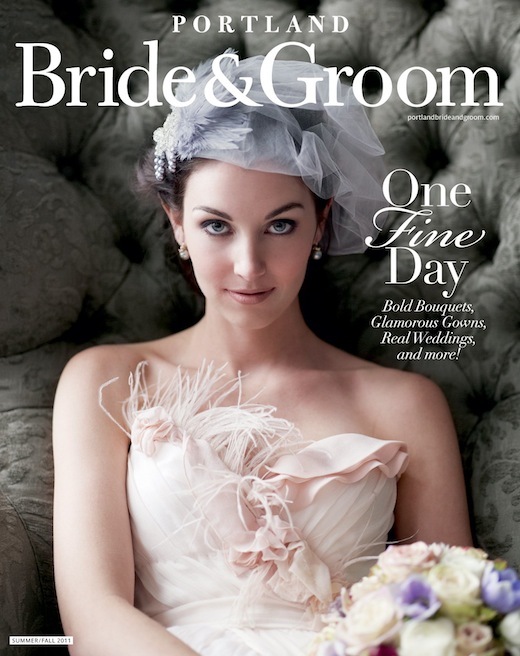 It just came out yesterday and I saw that one of my bouquets was on the cover! It’s such a beautiful magazine and I am thrilled to have taken part in the making of this issue. Stay tuned for more pictures and some behind the scenes shots of the two day shoot!